Magneti Marelli’s Suspension Systems business line took home the “Supplier of the Year” award given out by the magazine Vehicle Dynamics International during the ceremony held the presentation of the Vehicle Dynamics International Awards 2013 held in Stuttgart, Germany. The awards were given out during the international Global Automotive Components And Suppliers 2013 Tradeshow in the area “Vehicle Dynamics Zone” dedicated to the technology, components and development of vehicle dynamics and to the fine-tuning instruments for chassis, suspensions, steering, brakes and handling. Every year, the magazine Vehicle Dynamics International awards those companies that come up with the best ideas and innovations in the following six categories: “Car of the year”, “Development tool of the year”, “Innovation of the year”, “Dynamicist of the year”, “Dynamics team of the year” and “Supplier of the year”. Vehicle Dynamics International is the only international publication that deals with the suspensions of the future, steering systems, brakes, chassis, simulation and vehicle dynamics tests, electronics and technology. This prestigious publication comes out every six months and it is sent to a selected reader base of 10,000 engineers and sector operators. The international jury - consisting of 29 members from 19 different countries - considered Magneti Marelli Suspension Systems to be one of the world’s most innovative undertakings in this important technological area. For several years now, the Company has been developing light materials to be used in suspensions technology, using composite systems and ultra light steels. At present, the company’s research is focusing on alternative materials: not just carbon fibres but also materials made of fibreglass and basalt. 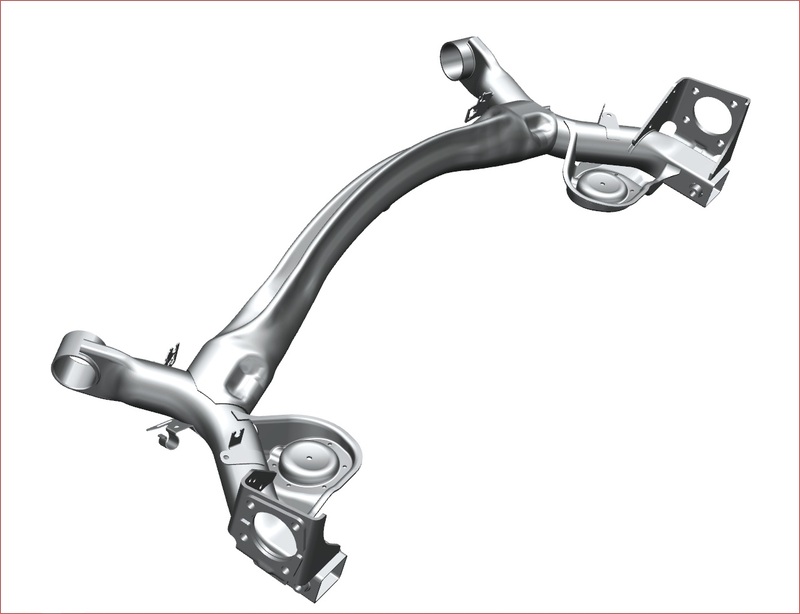 Suspension arms with a prototype shape have already been manufactured using composite materials with hybrid construction. The Company is also working on suspension sub-frames and knuckles again made of composite materials, with the goal of reducing the weight of the components. Magneti Marelli was also awarded for its innovative commitment in the search for materials aimed at reducing CO2 emissions for sustainable mobility. “We are honoured - stated Piero Monchiero R&D Director of Magneti Marelli Suspension Systems - that Vehicle Dynamics International has acknowledged our efforts in the search for light materials aimed at reducing the weight of automotive components to the benefit of sustainability. In fact, the company’s primary goal is to help carmakers achieve increasingly ambitious objectives even when it comes to sustainable mobility. This is why Magneti Marelli is always ready to take on new challenges, whatever their origin, and light materials represent one of these challenges. We are constantly committed to searching and developing better and better solutions that take into account the latest materials, of course without forgetting industrial dynamics and cost factors”.